Hi, I’m Chris Reddy, and I’m an environmental chemist at Woods Hole Oceanographic Institution, and I study oil spills. This is Wild Harbor salt marsh in Cape Cod, Massachusetts. 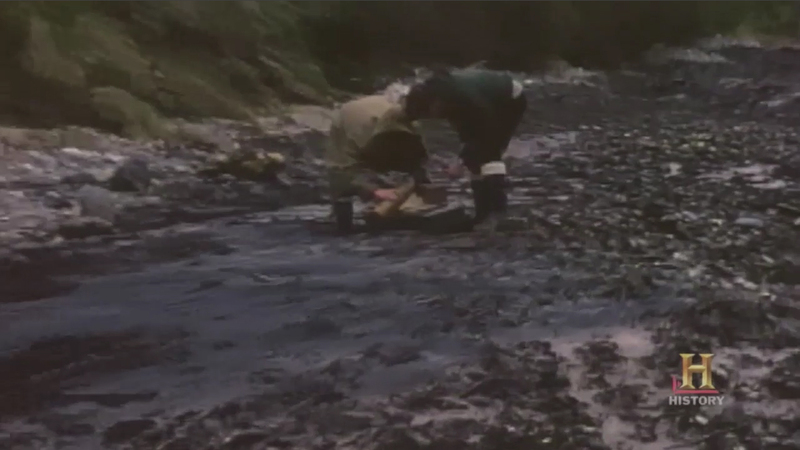 It was the location that was impacted by an oil spill in 1969. It’s a pretty beautiful place, but in reality, there is oil still present here. What’s interesting to us is, why has oil persisted here after 40 years? What are the conditions that do that? We’re interested in how nature responds to and uninvited guest, and in this case the uninvited guest is oil. This is a great place to work! What an office. This is Emily Peacock she’s my research assistant. So we’re gonna grab a sediment core today, and we got our barrel started in the ground. Now we’re going to go pretty low tech and start banging it into the ground. So we just buried this core about thirty centimeters down which will encompass about a hundred years and allow us to see the oil layer that’s buried about 40 years deep. So we have a nice core. It’s preserved. We’re gonna bring it back to the lab. We’re gonna cut it into different slices. We’re gonna analyze each slice for oil. We’re trying to essentially build a new understanding of how oil will warehouse over forty years. This is the top part so this is the most recent material and we think in this case the oil that got deposited in 1969is about this location. And when we get to that depth we should maybe be able to say we can smell it. It doesn’t look like the Exxon Valdez, but there is oil here. And I mean, I don’t even need to bring it close to my nose, I know there’s oil right here. It smells like plain oil diesel fuel and it’s pretty strong. This is definitely the most oiled layer. This just made our day. There is a lot of oil in this core. When this spill first occurred in 1969, about a month after I was born, people thought that it would only last a week. We’re consistently building a map of where oil exists. In this region right around here, there’s as much oil as there was in 1969. So our driving question is, why this spot? We believe this spot has allowed the oil to persist because it’s so quiet and so sleepy, that it hasn’t been inundated by the tides and other activity that allow the oil to be broken down or washed away. Oil still has a lot of biological impacts. What we have found out so far are three things. One, that the crabs who use the salt marsh don’t burrow as deeply. They don’t go past the oil layer they just can’t avoid the predators. So we’re talking about 15 to 20 generations later of crabs who are still paying the price of a spill that happened in 1969. Other results we have found is that the grass isn’t as thick and as strong in the oil contaminated regions as the other regions it’s more susceptible to erosion. And in the most recent data that we got has actually seen that some mussels that live nearest the oil are not doing as well either. We want to walk away at the end of the day and say, here are the conditions that allows oil to last for a long time. Because we want to advise the government when there’s the next oil spill to say, look, oil can last for a long time and has a lot of biological impact. Because sometimes they wanna say, don’t worry about it, nature’ll clean it up. But these chemicals are impacting the animals and plants that unfortunately got hit by a spill in 1969. We have a salt marsh that looks well, but is having trouble underneath.